Why Haven’t You Been to Ostara’s Altar Yet? There’s so much to embrace about the coming of Spring. There’s so much to embrace about the coming of Spring, and Ostara’s Altar has a lot of it! Gwyneth is frolicking in a field of flowers, my favourite flowers ever, the Ichi Fields from The Looking Glass. The ruins in the background are an amazing set from Delirium, called Ancient Temple. This is permanently on Awenia (well, as permanently as anything is on Awenia! ), and I love the gothic arches and the atmosphere of the place. I put lime trees from The Little Branch all around the temple, but you can’t see them in this photograph: check the ones below! But let’s get on to the important stuff! What is Gwyneth wearing? But let’s get on to the important stuff! What is Gwyneth wearing? 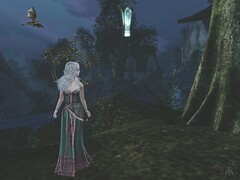 The dress is from Oubliette, and you can get it at Ostara’s Altar until 1pm SLT today, so hurry it up! It’s called Maia, and it comes in an amazing array of ombre colours, something for everyone, and the textures are fantastic! This hair is from Limerence, called Lamiya, and it’s still available at Lootbox. The amazing nails are from Dark Passions (natch! ), and they’re the Odin’s Pride set, also available at Lootbox. The skin is Lumae‘s wonderful new Neoma Catwa applier, here on the Catwa Lona head, and the extra makeup is from Adored; it’s the Unicute Shadows, which you can pick up at The Secret Hideout. I went crazy at that event this time around. Unicorn theme. You guys know how I am! Eyes are the Gem Eyes from Amara Beauty. Gwyneth’s ears are these great new ones from Swallow, the Noldor Elf Ears. I love the jewellery on these ears; I just wish they took Omega appliers (hint, hint, Swallow!). 🙂 The boots are from Luas, the Skadi boots, which are at Lootbox. Trousers are a standby from The Muses, the Laced Leather Pant. Body as always is the Maitreya mesh body, though I’ve been experimenting with the Tonic body lately and may do some photos with that one soon. Leaping! Gwyneth loves Spring, because as a natural Summer Queen, Spring is the beginning of her rise to power, which peaks at Midsummer. These poses are all from Grafica, by the way; they did some amazing dance poses a couple of years ago that I still use frequently. That said, I have been to Pose Fair, so be expecting some new ones in the weeks to come! This pose is from the Hela-Miyo Happy series, which is just a lot of fun. But look at the textures on that Oubliette dress. Yum, yum. I love it when things just look perfect and I don’t have to work too hard to make them perfect. I’m not including a style card with this post, as everything is described under the photos, but I will tell you this: Ostara’s Altar is closing at 1pm SLT today, so get yourself down there and do some last-minute shopping, because some of these exclusives are discounted and you don’t want to miss that!